On September 1, 1939, Germany invaded Poland under the false pretext that the Poles had carried out a series of sabotage operations against German targets near the border, an event that caused Britain and France to declare war on Germany. Following several staged incidents that German propaganda used as a pretext to claim that German forces were acting in self-defense, the first regular act of war took place on September 1, 1939, when the Luftwaffe attacked the Polish town of Wieluń, destroying 75% of the city and killing close to 1,200 people, most of them civilians. As the Wehrmacht advanced, Polish forces withdrew from their forward bases of operation close to the Polish-German border to more established lines of defense to the east. After the mid-September Polish defeat in the Battle of the Bzura, the Germans gained an undisputed advantage. On September 3 after a British ultimatum to Germany to cease military operations was ignored, Britain and France declared war on Germany. On October 8, after an initial period of military administration, Germany directly annexed western Poland and the former Free City of Danzig and placed the remaining block of territory under the administration of the newly established General Government. Battle of the Border: Refers to the battles that occurred in the first days of the German invasion of Poland in September, 1939; the series of battles ended in a German victory as Polish forces were either destroyed or forced to retreat. Gleiwitz incident: A false flag operation by Nazi forces posing as Poles on August 31, 1939, against the German radio station Sender Gleiwitz in Gleiwitz, Upper Silesia, Germany on the eve of World War II in Europe. The goal was to use the staged attack as a pretext for invading Poland. The Invasion of Poland, also known as the September Campaign, was a joint invasion of Poland by Nazi Germany, the Free City of Danzig, the Soviet Union, and a small Slovak contingent that marked the beginning of World War II in Europe. The German invasion began on September 1, 1939, one week after the signing of the Molotov-Ribbentrop Pact, while the Soviet invasion commenced on September 17 following the Molotov-Tōgō agreement that terminated the Russian and Japanese hostilities in the east on September 16. The campaign ended on October 6 with Germany and the Soviet Union dividing and annexing the whole of Poland under the terms of the German-Soviet Frontier Treaty. German forces invaded Poland from the north, south, and west the morning after the Gleiwitz incident. As the Wehrmacht advanced, Polish forces withdrew from their forward bases of operation close to the Polish-German border to more established lines of defense to the east. After the mid-September Polish defeat in the Battle of the Bzura, the Germans gained an undisputed advantage. Polish forces then withdrew to the southeast where they prepared for a long defense of the Romanian Bridgehead and awaited expected support and relief from France and the United Kingdom. While those two countries had pacts with Poland and declared war on Germany on September 3, in the end their aid to Poland was limited. The Soviet Red Army’s invasion of Eastern Poland on September 17, in accordance with a secret protocol of the Molotov-Ribbentrop Pact, rendered the Polish plan of defense obsolete. Facing a second front, the Polish government concluded that defense of the Romanian Bridgehead was no longer feasible and ordered an emergency evacuation of all troops to neutral Romania. On October 6, following the Polish defeat at the Battle of Kock, German and Soviet forces gained full control over Poland. The success of the invasion marked the end of the Second Polish Republic, though Poland never formally surrendered. On October 8, after an initial period of military administration, Germany directly annexed western Poland and the former Free City of Danzig and placed the remaining block of territory under the administration of the newly established General Government. The Soviet Union incorporated its newly acquired areas into its constituent Belarusian and Ukrainian republics and immediately started a campaign of sovietization. In the aftermath of the invasion, a collective of underground resistance organizations formed the Polish Underground State within the territory of the former Polish state. Many military exiles who managed to escape Poland subsequently joined the Polish Armed Forces in the West, an armed force loyal to the Polish government in exile. A map of Europe depicting the Invasion of Poland from Germany and the Soviet Union. Following several staged incidents (like the Gleiwitz incident, part of Operation Himmler), in which German propaganda was used as a pretext to claim that German forces were acting in self-defense, the first regular act of war took place on September 1, 1939, when the Luftwaffe attacked the Polish town of Wieluń, destroying 75% of the city and killing close to 1,200 people, mostly civilians. This invasion subsequently began World War II. Five minutes later, the old German pre-dreadnought battleship Schleswig-Holstein opened fire on the Polish military transit depot at Westerplatte in the Free City of Danzig on the Baltic Sea. Four hours later, German troops—still without a formal declaration of war issued—attacked near the Polish town of Mokra. The Battle of the Border had begun. Later that day, Germans attacked on Poland’s western, southern and northern borders while German aircraft began raids on Polish cities. The main axis of attack led eastwards from Germany proper through the western Polish border. Supporting attacks came from East Prussia in the north and a co-operative German-Slovak tertiary attack by units from German-allied Slovakia in the south. All three assaults converged on the Polish capital of Warsaw. Invasion of Poland: Soldiers of the German Wehrmacht tearing down the border crossing between Poland and the Free City of Danzig, September 1, 1939. On September 3 after a British ultimatum to Germany to cease military operations was ignored, Britain and France, followed by the fully independent Dominions of the British Commonwealth—Australia (3 September), Canada (10 September), New Zealand (3 September), and South Africa (6 September)—declared war on Germany. However, initially the alliance provided limited direct military support to Poland, consisting of a cautious, half-hearted French probe into the Saarland. The German-French border saw only a few minor skirmishes, although the majority of German forces, including 85% of their armored forces, were engaged in Poland. Despite some Polish successes in minor border battles, German technical, operational, and numerical superiority forced the Polish armies to retreat from the borders towards Warsaw and Lwów. The Luftwaffe gained air superiority early in the campaign. By destroying communications, the Luftwaffe increased the pace of the advance, overrunning Polish airstrips and early warning sites and causing logistical problems for the Poles. Many Polish Air Force units ran low on supplies, and 98 withdrew into then-neutral Romania. The Polish initial strength of 400 was reduced to just 54 by September 14, and air opposition virtually ceased. The Western Allies also began a naval blockade of Germany, which aimed to damage the country’s economy and war effort. Germany responded by ordering U-boat warfare against Allied merchant and warships, which later escalated into the Battle of the Atlantic. The German-Soviet Treaty of Friendship was a secret supplementary protocol of the 1939 Hitler-Stalin Pact, signed on September 28, 1939, by Nazi Germany and the Soviet Union after their joint invasion and occupation of sovereign Poland that delineated the spheres of interest between the two powers. The German–Soviet Treaty of Friendship, Cooperation and Demarcation was a secret supplementary protocol of the 1939 Hitler-Stalin Pact, amended on September 28, 1939, by Nazi Germany and the Soviet Union after their joint invasion and occupation of sovereign Poland. These amendments allowed for the exchange of Soviet and German nationals between the two occupied zones of Poland, redrew parts of the central European spheres of interest dictated by the Molotov–Ribbentrop Pact, and stated that neither party to the treaty would allow on its territory any “Polish agitation” directed at the other party. The existence of this secret protocol was denied by the Soviet government until 1989, when it was finally acknowledged and denounced. The Molotov–Ribbentrop Pact, also known as the Nazi-Soviet Pact, was a neutrality pact between Nazi Germany and the Soviet Union signed in Moscow on August 23, 1939, that delineated the spheres of interest between the two powers. German-Soviet Frontier Treaty: Also known as the The German–Soviet Treaty of Friendship, Cooperation and Demarcation, this treaty was a secret clause amended on the Molotov–Ribbentrop Pact on September 28, 1939, by Nazi Germany and the Soviet Union after their joint invasion and occupation of sovereign Poland. Molotov–Ribbentrop Pact: A neutrality pact between Nazi Germany and the Soviet Union signed in Moscow on August 23, 1939. Wehrmacht: The unified armed forces of Nazi Germany from 1935 to 1946, including army (Heer), navy (Kriegsmarine), and air force (Luftwaffe). The German–Soviet Treaty of Friendship, Cooperation and Demarcation (later known as the German-Soviet Frontier Treaty ) was a second supplementary protocol of the 1939 Hitler-Stalin Pact. It was a secret clause as amended on September 28, 1939, by Nazi Germany and the Soviet Union after their joint invasion and occupation of sovereign Poland and thus after the beginning of World War II. It was signed by Joachim von Ribbentrop and Vyacheslav Molotov, the foreign ministers of Germany and the Soviet Union respectively, in the presence of Joseph Stalin. The treaty was a follow-up to the first secret protocol of the Molotov–Ribbentrop Pact signed on August 23, 1939, between the two countries prior to their invasion of Poland and the start of World War II in Europe. Only a small portion of the protocol which superseded the first treaty was publicly announced, while the spheres of influence of Nazi Germany and the Soviet Union remained classified. The third secret protocol of the Pact was signed on January 10, 1941 by Friedrich Werner von Schulenberg and Molotov, in which Germany renounced its claims to portions of Lithuania only a few months before its anti-Soviet Operation Barbarossa. Several secret articles were attached to the treaty. These allowed for the exchange of Soviet and German nationals between the two occupied zones of Poland, redrew parts of the central European spheres of interest dictated by the Molotov–Ribbentrop Pact, and stated that neither party would allow on its territory any “Polish agitation” directed at the other party. During the western invasion of Poland, the German Wehrmacht had taken control of the Lublin Voivodeship and eastern Warsaw Voivodeship, territories that according to the Molotov–Ribbentrop Pact were in the Soviet sphere of influence. To compensate the Soviet Union for this “loss,” the treaty’s secret attachment transferred Lithuania to the Soviet sphere of influence, with the exception of a small territory in the Suwałki Region sometimes known as the Suwałki Triangle. After this transfer, the Soviet Union issued an ultimatum to Lithuania, occupied it on June 15, 1940, and established the Lithuanian SSR. The existence of this secret protocol was denied by the Soviet government until 1989, when it was finally acknowledged and denounced. Some time later, the new Russian revisionists, including historians Alexander Dyukov and Nataliya Narotchnitskaya, described the pact as a necessary measure because of the British and French failure to enter into an anti-fascist pact. Vladimir Putin has also defended the pact. German–Soviet Treaty of Friendship: Soviet Foreign Minister Vyacheslav Molotov signs the German–Soviet Pact in Moscow, September 28, 1939; behind him are Richard Schulze-Kossens (Ribbentrop’s adjutant), Boris Shaposhnikov (Red Army Chief of Staff), Joachim von Ribbentrop, Joseph Stalin, Vladimir Pavlov (Soviet translator). Alexey Shkvarzev (Soviet ambassador in Berlin), stands next to Molotov. The Molotov–Ribbentrop Pact, also known as the Nazi-Soviet Pact, was a neutrality pact between Nazi Germany and the Soviet Union signed in Moscow on August 23, 1939 by foreign ministers Joachim von Ribbentrop and Vyacheslav Molotov, respectively. The pact delineated the spheres of interest between the two powers, confirmed by the supplementary protocol of the German-Soviet Frontier Treaty amended after the joint invasion of Poland. The pact remained in force for nearly two years until the German government of Adolf Hitler launched an attack on the Soviet positions in Eastern Poland during Operation Barbarossa on June 22, 1941. The clauses of the Nazi-Soviet Pact provided a written guarantee of non-belligerence by each party towards the other and a declared commitment that neither government would ally itself to or aid an enemy of the other party. 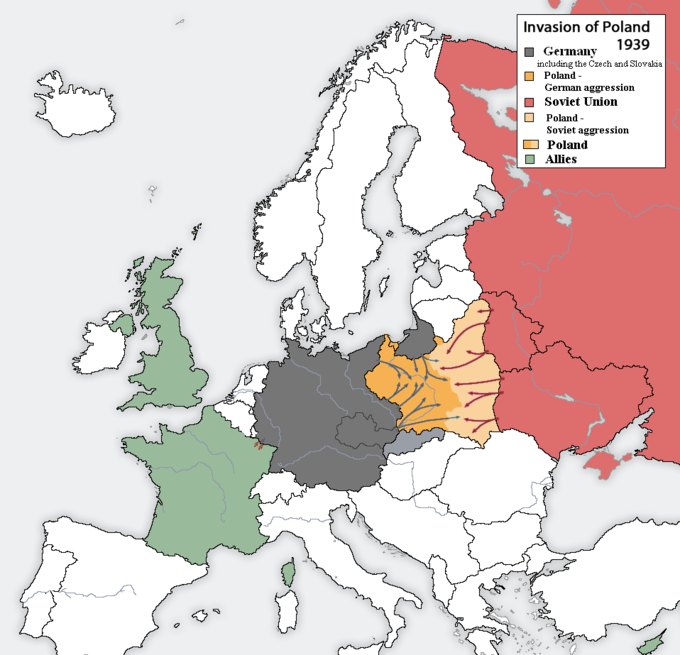 In addition to stipulations of non-aggression, the treaty included a secret protocol that divided territories of Poland, Lithuania, Latvia, Estonia, Finland, and Romania into German and Soviet “spheres of influence,” anticipating “territorial and political rearrangements” of these countries. Thereafter, Germany invaded Poland on September 1, 1939. Soviet Union leader Joseph Stalin ordered the Soviet invasion of Poland on September 17, a day after the Soviet–Japanese ceasefire agreement came into effect. In November, parts of southeastern Finland were annexed by the Soviet Union after the Winter War. This was followed by Soviet annexations of Estonia, Latvia, Lithuania, and parts of Romania. Advertised concern about ethnic Ukrainians and Belarusians had been proffered as justification for the Soviet invasion of Poland. Stalin’s invasion of Bukovina in 1940 violated the pact as it went beyond the Soviet sphere of influence agreed with the Axis. The Dunkirk evacuation was the removal of Allied soldiers from the beaches and harbor of Dunkirk by the attack of German soldiers, which started as a disaster but soon became a miraculous triumph. During the 1930s, the French constructed the Maginot Line, a series of fortifications along their border with Germany. The area immediately to the north of the Maginot Line was covered by the heavily wooded Ardennes region, which French General Philippe Pétain declared to be “impenetrable” as long as “special provisions” were taken. The German army decided to attach through the Ardennes region, then establish bridgeheads on the Meuse River and rapidly drive to the English Channel. This would cut off the Allied armies in Belgium and Flanders. When this occurred and the French army was surrounded, the British decided on a plan of evacuation. On the first day of the evacuation, only 7,669 men were evacuated, but by the end of the eighth day, a total of 338,226 soldiers had been rescued by a hastily assembled fleet of over 800 boats. More than 100,000 evacuated French troops were quickly and efficiently shuttled to camps in various parts of southwest England, where they were temporarily lodged before being repatriated. Dunkirk evacuation: The evacuation of Allied soldiers from the beaches and harbour of Dunkirk, France, between May 26 and June 4, 1940, during World War II. Maginot Line: A line of concrete fortifications, obstacles, and weapon installations that France constructed on the French side of its borders with Switzerland, Germany, and Luxembourg during the 1930s. Vichy France: The common name of the French State during World War II, specifically the southern, unoccupied “Free Zone,” as Germany militarily occupied northern France. On the first day of the evacuation, only 7,669 men were evacuated, but by the end of the eighth day, a total of 338,226 soldiers had been rescued by a hastily assembled fleet of over 800 boats. Many troops were able to embark from the harbor’s protective mole onto 39 British destroyers and other large ships, while others had to wade out from the beaches, waiting for hours in the shoulder-deep water. Some were ferried from the beaches to the larger ships by what came to be known as the little ships of Dunkirk, a flotilla of hundreds of merchant marine boats, fishing boats, pleasure craft, and lifeboats called into service for the emergency. The British Expeditionary Force (BEF) lost 68,000 soldiers during the French campaign and had to abandon nearly all of their tanks, vehicles, and other equipment. More than 100,000 evacuated French troops were quickly and efficiently shuttled to camps in various parts of southwest England, where they were temporarily lodged before being repatriated. British ships ferried French troops to Brest, Cherbourg, and other ports in Normandy and Brittany, although only about half of the repatriated troops were deployed against the Germans before the surrender of France. For many French soldiers, the Dunkirk evacuation represented only a few weeks’ delay before being killed or captured by the German army after their return to France. Of the French soldiers evacuated from France in June 1940, about 3,000 joined Charles de Gaulle’s Free French army in Britain. Dunkirk Evacuation: British troops evacuating Dunkirk’s beaches. In 1939, after Nazi Germany invaded Poland marking the beginning of the Second World War, the United Kingdom sent the BEF to aid in the defense of France, landing troops at Cherbourg, Nantes, and Saint-Nazaire. By May 1940 the force consisted of ten divisions in three corps under the command of General John Vereker, 6th Viscount Gort. Working with the BEF were the Belgian Army and the French First, Seventh, and Ninth Armies. During the 1930s, the French constructed the Maginot Line, a series of fortifications along their border with Germany. This line was designed to deter a German invasion across the Franco-German border and funnel an attack into Belgium, where it would be met by the best divisions of the French Army. Thus, any future war would take place outside of French territory, avoiding a repeat of the First World War. The area immediately to the north of the Maginot Line was covered by the heavily wooded Ardennes region, which French General Philippe Pétain declared to be “impenetrable” as long as “special provisions” were taken. He believed that any enemy force emerging from the forest would be vulnerable to a pincer attack and destroyed. The French commander-in-chief, Maurice Gamelin, also believed the area to be of limited threat, noting that it “never favoured large operations.” With this in mind, the area was left lightly defended. The initial plan for the German invasion of France called for an encirclement attack through the Netherlands and Belgium, avoiding the Maginot Line. Erich von Manstein, then Chief of Staff of the German Army Group A, prepared the outline of a different plan and submitted it to the OKH (German High Command) via his superior, Generaloberst Gerd von Rundstedt. Manstein’s plan suggested that Panzer divisions should attack through the Ardennes, then establish bridgeheads on the Meuse River and rapidly drive to the English Channel. The Germans would thus cut off the Allied armies in Belgium and Flanders. This part of the plan later became known as the Sichelschnitt (“sickle cut”). Adolf Hitler approved a modified version of Manstein’s ideas, today known as the Manstein Plan, after meeting with him on February 17. On May 10, Germany attacked Belgium and the Netherlands. Army Group B, under Generaloberst Fedor von Bock, attacked into Belgium, while the three Panzer corps of Army Group A under Rundstedt swung around to the south and drove for the Channel. The BEF advanced from the Belgian border to positions along the River Dyle within Belgium, where they fought elements of Army Group B starting on May 10. They were ordered to begin a fighting withdrawal to the Escaut River on May 14 when the Belgian and French positions on their flanks failed to hold. During a visit to Paris on May 17, British Prime Minister Winston Churchill was astonished to learn from Gamelin that the French had committed all their troops to the ongoing engagements and had no strategic reserves. On May 19, Gort met with French General Gaston Billotte, commander of the French First Army and overall coordinator of the Allied forces. Billotte revealed that the French had no troops between the Germans and the sea. Gort immediately saw that evacuation across the Channel was the best course of action and began planning a withdrawal to Dunkirk, the closest location with good port facilities. Surrounded by marshes, Dunkirk boasted old fortifications and the longest sand beach in Europe, where large groups could assemble. After continued engagements and a failed Allied attempt on May 21 at Arras to cut through the German spearhead, the BEF was trapped along with the remains of the Belgian forces and the three French armies in an area along the northern French coast. By May 24, the Germans had captured the port of Boulogne and surrounded Calais. Later that day, Hitler issued Directive 13, which called for the Luftwaffe to defeat the trapped Allied forces and stop their escape. On May 26, Hitler ordered the panzer groups to continue their advance, but most units took another 16 hours to attack. The delay gave the Allies time to prepare defenses vital for the evacuation and prevented the Germans from stopping the Allied retreat from Lille. Vichy France is the common name of the French State headed by Marshal Philippe Pétain during World War II. In particular, it represents the unoccupied “Free Zone” (zone libre) that governed the southern part of the country. From 1940 to 1942, while the Vichy regime was the nominal government of France as a whole, Germany’s military occupied northern France. Thus, while Paris remained the de jure capital of France, the de facto capital of southern “unoccupied” France was the town of Vichy, 360 km to the south. Following the Allied landings in French North Africa in November 1942, southern France was also militarily occupied by Germany and Italy. The Vichy government remained in existence, but as a de facto client and puppet of Nazi Germany. It vanished in late 1944 when the Allies occupied all of France. The French State maintained nominal sovereignty over the whole of French territory, but had effective full sovereignty only in the Free Zone. It had limited civil authority in the northern zones under military occupation. The occupation was to be provisional pending the conclusion of the war, which at the time appeared imminent. The occupation also presented certain advantages, such as keeping the French Navy and the colonial empire under French control and avoiding full occupation of the country by Germany, thus maintaining a meaningful degree of French independence and neutrality. The French Government at Vichy never joined the Axis alliance.